A group of boosters was touting a new route for a proposed Columbia Basin irrigation project – although this was not the same irrigation project that was later made possible by the Grand Coulee Dam. This audacious scheme would take water from the Pend Oreille River and convey it halfway across the state via canal and tunnel to the arid Columbia Basin. The original plan called for a route north of Spokane, crossing the Spokane River near Nine Mile Falls. 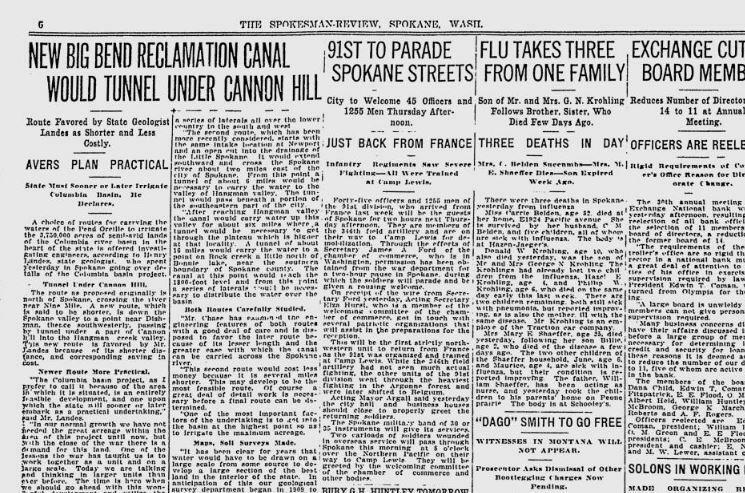 Now, engineers were studying a new route, tunneling right under Cannon Hill in Spokane. It would go down the Spokane Valley, and then enter a tunnel near Dishman and go directly under the southern part of Spokane, into the Hangman Creek. This route would be shorter and less costly. Yet the entire scheme would still be vastly expensive, even in 1919 money. Engineers estimated that the project would cost between $75 million and $100 million. Yet they said it would be worth the expense because it would open up 3.75 million acres of new agricultural land in the state. From the flu beat: The Spanish flu epidemic was by no means over. Three more people died, bringing the flu death total to 16 for the week, and 457 altogether. One of the victims was a 10-year-old, who became the third in his family to die.